From left: Lindsay Ramagli (Repêchage), Miranda Garcia-Galvez, Peter Dudek and Delanie West (both of Repêchage). 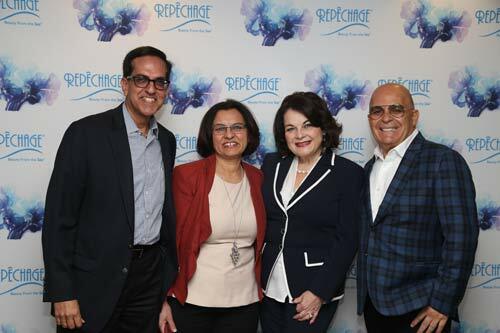 The spa experience should be about enveloping all of the senses, something clients of all ages can touch, see, smell, taste and hear, industry experts said at Repêchage's 18th International Conference in New York. As part of a sensory experience, Repêchage launched Fusion Express Bar and Spa Masks with nutriceutical organic actives as well as an at-home moisturizer and face/body wash for all ages. Conference attendees at the Affinia Hotel watched demos and some experienced the food-fragrant spa masks, which were dubbed a smoothie for the skin. “We are using our renowned seaweed-based mask and infusing it with ingredients culled from the culinary world that have true benefits for the skin,” said Sarfati. "We have decided to really tantalize the senses to create a full experience not only for adults, but for as well, children," she said. To demonstrate Fusion's natural origins, Repêchage ended each product demo by giving the client a drinkable natural smoothie which contained the same flavor and active ingredients as the spa mask. The masks combine Laminaria digitata seaweed, as well as aloe vera, orange water, coconut oil, and acai berry with organic flavor actives of chocolate, matcha (green tea), mixed berries (blueberry, strawberry and beet root), and vanilla and pumpkin actives to create the four Fusion Facials: Chocofina Fusion, Matchafina Fusion, Berryfina Fusion and Vanillafina Fusion. And they all smell like you can eat them. 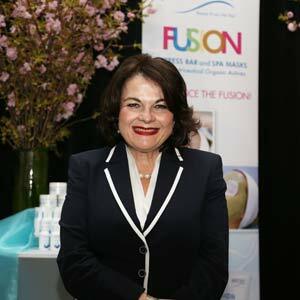 The Fusion facials take about 30 minutes and involve eight steps: applying the Fusion cleansing cream, removing it, massaging the client's face with the Fusion massage cream, mixing the actives with the "flavor" packet and applying the mask, applying the eye rescue pads, peeling off the mask, cleaning any mask residue and moisturizing the skin. Sarfati said the new facial is the ideal treatment for youngsters, who need a getaway from their over-consumed digital lives. A trip to the spa is a healthy, natural and therapeutic outlet for them and it’s never too early to start good skin care habits, she said. The key is introducing facial massage and treatment as one that is fun, interesting, relatable to the younger generation—and more professional than just a cream mask and cucumbers for the eyes. "It feels like ice cream," said Miranda Garcia-Galvez, a youngster who demonstrated the mask as a beauty treatment that could be on the menu at a mother-daughter spa. At its 18th International Conference, Repêchage launched its new customizeable mask concept, where one of four food-fragrant organic active packets could be mixed into its alginate mask before application for a sensory adventure for all ages. The company's founder and CEO, Lydia Sarfai, discussed the inspiration behind the launch while the Chocofina version of the mask was demonstrated on a young girl. "You can really expand your menu with [it] in so many different ways," said Sarfati. 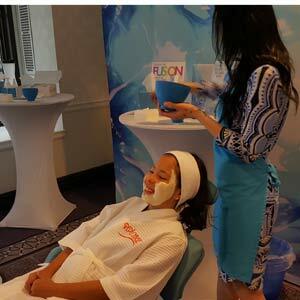 Aside from the Fusion Facial, conference speakers offered other tips on how to create a more naturally fragrant spa. Sarfati said you need to walk the talk: If a spa wants to evoke a natural, organic image, it should have fresh flowers on display rather than plastic. There's a strong connection between the brain and skin care, added Andrea Bovero, Ph.D, professor of Cosmetology and Communication of Beauty and Wellness and president of CIDESCO Italy. Emphasizing that a connection to the mind and body of a client is through a multi-sensory approach, Bovero told the audience that the sense of smell is the most important of all the senses because it is linked with memories. By using scent, brands can connect with consumers on a deep emotional level, resulting in a memorable experience and long-term brand loyalty. Samuel Shatkin, FACS, M.D., owner of Aesthetic Associate Centre for Plastic Surgery in Buffalo, New York, presented a list of ways in which medical procedures can be combined with professional, and sensory skin care treatments. For example, you can perform a facial treatment during a teeth whitening session or as a pre- and post-op treatment for surgical procedures to treat a client’s skin. He also noted that every esthetician should have a good referral base with a dermatologist and that both can help one another and the client. Yolanda (Mayola) Amador Origel, international spa consultant and Repêchage Mexico distributor, pointed out the importance of understanding what makes one’s spa different from the competition. Innovative spa concepts that she has brought to Mexico included: Melange World Spa, a spa based on cultural spa traditions from around the world; Mamma Mia Salon & Facial Bar, an outlet for mothers and daughters to get pampered together; and Barber & Booze, a venue for male grooming services that offers a lounge area to enjoy a signature, mixology cocktail. For the last portion of the event, Sarfati presented the President’s Awards, given in various categories to an establishment or person that demonstrates esthetic excellence as well as dedication to the elevation of the industry. Bikram Sapra of JB Skincare received the President’s Award for Distributor of the Year as a result of his enormous growth of Repêchage in India’s competitive skin care market. Euracom, Repêchage’s exclusive distributor in Italy, received the Award of Excellence in Marketing. The Rising Star award went to Odalisa Dominguez, creator of Spa O on the Go, a mobile day spa that brings the spa experience to the venue of one’s choice. Mamma Mia Salon and Facial Bar received the Award of Excellence in Innovation for their unique “mother-daughter” spa concept—the first of its kind in Mexico. Yolanda (Mayola) Amador Origel who played a role in helping this creative concept come to fruition, accepted on behalf of Juan Carlos & Carolina Sierra, owners of Mamma Mia Salon and Facial Bar. With these takeaways from the conference, spa owners can start to put more sense into the spa.